Oh man, I honestly thought I’d never feel normal every again after my two-and-a-bit weeks of cold/cough/throat/chest things. I started to get a bit depressed, lying in bed all day, and even my marathon reading sessions didn’t really cheer me up. (On that note: I have so many new book recommendations for you. I’m going to do a post or a video next week!) 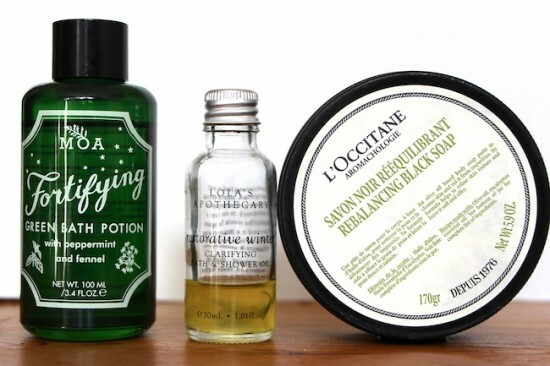 I had to dig out some of my best anti-cold products for the bath (see photo above, read about them here) and I pretty much lived in my two-vests-underneath-two-sweatshirts illness outfit, which Mr AMR forced me to wear as well as a SCARF. Indoors. And in bed. It’s amazing I didn’t strangulate myself in my sleep. Anyway, here I am, limping at half-speed back into work and trying to get going with all of the things that need doing. The biggest project at the moment is to get my office/studio sorted; we moved back into our house in September and I still can’t get into my office because it’s packed with boxes almost up to the ceiling. I keep finding things broken every time I go in there (last time it was a photographic light, more often than not it’s bottles of nail polish that have been crushed and broken) and so I almost dread opening the door. The worst thing about the whole situation is that one whole side of the building is window, so every time we look from the house into the garden we see into my rubbish-tip of an office! But finding the time to go in and tidy is proving to be rather difficult; I did two hours just after Christmas but barely even made a dent in the piles of stuff that needs to be sorted… Though I did find two out-of-date boxes of Marc de Champagne truffles and my eyelash comb, so that was a bonus. The truffles (two years past the sell-by) had gone as hard as conkers, but the comb was a good discovery. If rather boring by comparison. Favourite thing of the week – and I had really been looking forward to this coming out – James Corden’s “Carpool Karaoke” with Adele. I don’t have Sky TV, so I didn’t know about Carpool Karaoke until a friend sent me a link to a Youtube clip, but I’ve watched most of them now (James Corden interviews pop stars in his car and they sing along to some of their best-known hits) and I find them quite addictive! This episode with Adele is just brilliant – she has the dirtiest laugh and a great sense of humour. I’ve watched it three times now… I’ve embedded it above for your viewing pleasure. Have a lovely Sunday everyone – there’s a skincare video going up tonight on my channel, but I’ll post it here on the website tomorrow if you can’t be bothered to go hunting for it. My channel page is here.